Let’s Break Down the Ranks! As of this post, there are currently 19 different Beachbody Coaching ranks. Each level earns compensations and new perks each and every week. Beachbody Coach ranks are calculated on Wednesday at 12 AM Eastern time. Your rank is based on your personal volume and your team volume (what is going on with your right and left leg). For me personally, coaching has changed my life. I was able to leave corporate America to pursue my calling to help others create healthy, balanced lives … while also being able to design my life to work from home. Something that was important for me before starting a family. And along the way … I’ve met INCREDIBLE, driven people who are passionate about helping others succeed – who just push you through their own action to be better. It’s rewarding not only financially, but also in the new friends I’ve made who’ve helped shape my life in the process. Click here if you want to be a Beachbody Coach! You will receive an email within 24 hours from me to welcome you to our team and help you get started right! Want to chat one-on-one? Email me vanessa@toughknockouts.com. The chart below visually shows you what it looks like to grow from Inactive Coach, to Active Diamond Rank. INACTIVE rank (the white circle) – has not sold or purchased 50 PV (approximately $55) worth of product in the past 5 weeks. They do not receive a bonuses. They will not receive paycheck because they have not sold anything. ACTIVE coach (the blue circle) – has sold or purchased 50 PV ($55) or more in the past 5 weeks. If the coach has sold any products to a client, he will receive a paycheck totaling the his or her commissions each Thursday. EMERALD – has 2 personally sponsored (PS) active coaches on each leg. Personally sponsored (PS) means they signed up through you. As an Emerald coach, you will qualify for customer leads and team bonuses ($15-19) up to 40 times a day! Your team bonus is calculated by what your PS coaches do so it’s important to help them learn how to be a successful coach. RUBY – has an Emerald coach on each leg. You earn the same customer leads as an Emerald coach and a team bonus ($19-22) up to 75 times a day! You ALSO get a 5% weekly team cycle bonus (5% of whatever your Emerald coaches earn in team bonuses). Then you get into the “Big-Dawgs” – the Star Diamonds! 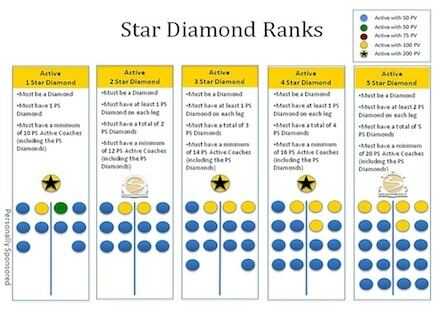 Each “Star” represents a coach who’s joined you and also attained the Diamond Beachbody coach rank. A 2-Star Diamond is someone with a Diamond coach on each leg. They will also earn .5% of the quarterly Diamond Bonus Pool which is a nice bonus! A Beachbody Coach ranked at 15-Star Diamond could make 6-figures just from bonuses. Crazy-cool right?! I know all of the Beachbody Coach Ranks can sound confusing, so I would love to help if you have any questions. My email is vanessa@toughknockouts.com. But maybe you’re READY to be a #GirlBoss now & sign up as a Beachbody coach? Would LOVE to help you get started and continue to reach your goals. I offer our team a 7-Day QUICK START training, 3-weeks of SMART START training based on YOUR goals, year-round incentives and a private Facebook group for support.